Franklin’s Charge has been involved in an effort to acquire the cotton gin property along Columbia Pike and to develop a battlefield park open to the public. Much progress has been made. However, the work is certainly not finished. Franklin's Charge will seek to purchase and preserve additional core battlefield property. 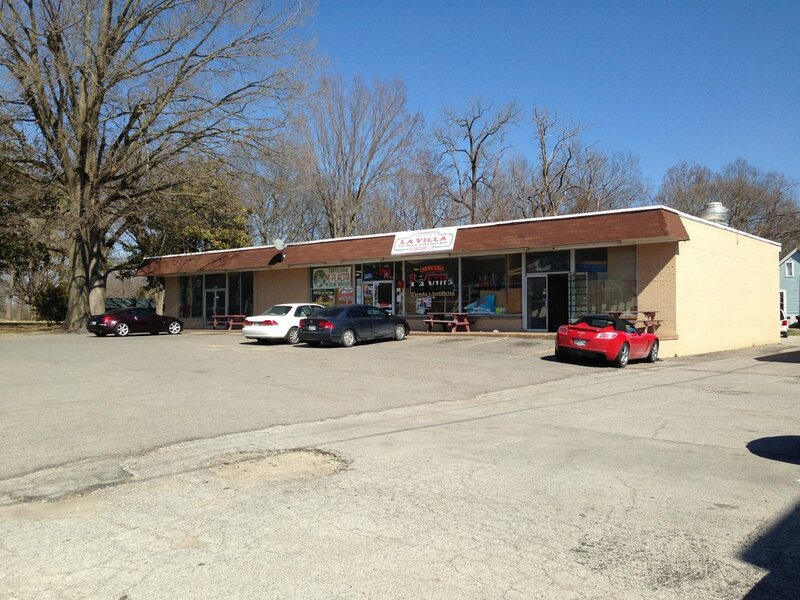 BEFORE: This strip center, along with a Domino's Pizza, was demolished to make way for Carter Hill Battlefield Park. AFTER: The site of the former strip center and Domino's Pizza is now being developed into an open battlefield park. Franklin's Charge is working to place six full size replica non firing cannons on carriages on the cotton gin portion of the Carter Hill Battlefield Park in the exact location these cannon occupied during the Battle of Franklin, November 30, 1864. The cotton gin property consists of three acres along and east of Columbia Pike, across from and slightly south of The Carter House. The property was successfully reclaimed from commercial use by a private and public preservation effort. Following demolition of the commercial structures, the property was deeded to the City of Franklin for use as a city park to be called the Carter Hill Battlefield Park and becomes a part of more than twenty acres currently contained in the Carter Hill Battlefield Park. A group of interested citizens formed a committee called "The Cannon on the Battlefield Committee" to work toward raising the funds to place authentic, full size, non firing replica Civil War cannons on carriages on the site to greatly enhance the historical accuracy of the site, enhance the visitor understanding and visual experience while visiting the site. Franklin's Charge is facilitating the fundraising efforts. The three inch ordnance rifle cannon was used by the Kentucky battery at the Battle of Franklin. The twelve pound Napoleon cannon was operated by the Ohio battery that were positioned in front of the cotton gin at the Battle of Franklin. During the Battle of Franklin, November 30, 1864, there were a total of six Federal cannon in action on the portion of the battlefield we now refer to as the cotton gin site. The property was the site of the Carter family cotton gin and that structure became a very famous landmark for the soldiers on both sides who fought at Franklin. The main Federal trench line ran in front of the gin house and bent in a north westerly direction to intersect with the Columbia Pike and then beyond the pike to the west. Having six cannons on that size property represented incredible fire power and destructive capability for the Federals and it was certainly put to terrible use that day. However, the four gun section of the First Kentucky (Federal) Battery was actually over run and captured by the Confederates when they breached the Federal trench line only to later be recaptured by the Federals. The cannon utilized by that Kentucky battery were three inch ordnance rifle cannons. To the east of the Kentucky battery was a two gun section on the Sixth Ohio Battery positioned in front of the cotton gin. Those two cannon were the twelve pound Napoleon cannons. It was in this section of the battlefield that witnessed the deaths of so many Confederate soldiers including Generals Cleburne, Adams, and Granbury. After so many years of working towards reclaiming and making the Carter Hill Battlefield Park a reality, we are now within reach of the final product. It is only fitting that we make every effort to finish this section of the battlefield park with a dramatic and realistic presentation of how it would have looked on November 30, 1864. The Cannon on the Battlefield Committee strongly believes adding the cannons to the City of Franklin's Carter Hill Battlefield Park will greatly enhance the historical accuracy of the park, help honor the memory and sacrifice of those brave soldiers who fought here and be a tremendous asset to The Carter House and Carnton and the marketing efforts of The Battle of Franklin Trust. Franklin's Charge recently received a grant from the Tennessee Wars Commission for $40,000 for the Cannons on the Battlefield project. Franklin’s Charge received a grant from Tennessee Wars Commission to conduct archaeological excavations to locate the Union trench line established at the Cotton Gin site, during the 1864 Battle of Franklin. Franklin’s Charge received a grant from the Tennessee Wars Commission to conduct a study of the site of the Union earthworks fort in Triune. The study was conducted by Phil Thomason & Associates with assistance from Fred Prouty and the Tennessee Wars Commission. A public meeting was conducted by Phil Thomason with landowners, representatives of the Land Trust for Tennessee, and Civil War groups to discuss the results. Franklin’s Charge successfully obtained a $300,000 Congressional grant to study Franklin’s Civil War sites and the opportunity to involve the National Park Service in the Franklin Civil War story. Franklin’s Charge has received grants from the Civil War Preservation Trust, the American Battlefield Protection Program, the State of Tennessee (Heritage Conservation Trust Fund Program), the Tennessee Civil War National Heritage Area, the Tennessee Civil War Preservation Association, the Tennessee Wars Commission, and Williamson County, Tennessee. Franklin’s Charge was awarded the Shelby Foote Preservation Legacy Award by the Shelby Foote Preservation Legacy Award by the Civil War Preservation Trust in 2006. Over the past four years, representatives of Franklin’s Charge have been asked to write articles and make presentations to various regional and local civil groups about the successful public/private partnership efforts conducted by Franklin’s Charge. At different times, Robert Hicks and Ernie Bacon, successive presidents of Franklin’s Charge have been recognized by the Tennessee Civil War Preservation Association for outstanding service to the preservation of Civil War sites in Tennessee, receiving the Bob Ragland Award.